That’s right folks – I actually had another trade up this week! Unfortunately, it yielded the same result as my AUD/JPY trade – a big red mark on my account. 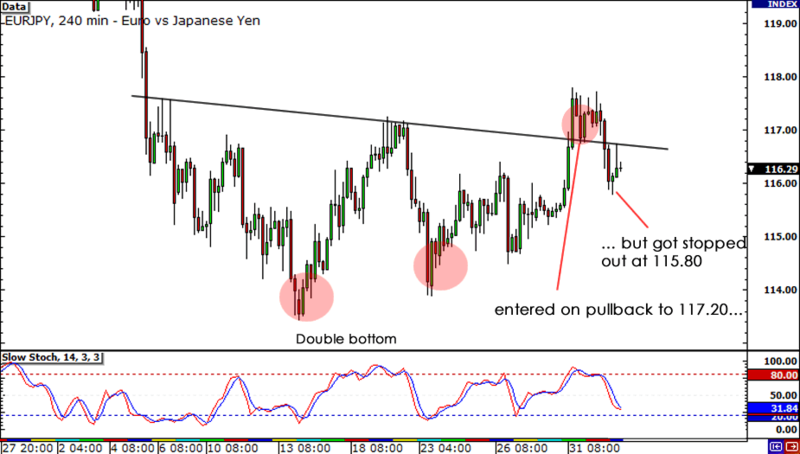 There were three main reasons why I went long on EUR/JPY earlier this week. First, I felt that the we would continue to see the euro rally after the markets responded positively to news that Greece may receive another round of bailout money. Second, I got more evidence to fuel my bearishness on the yen when Moody’s decided to place Japan on downgrade watch. With the economy still feeling the effects of the earthquake last March and with the possibility of more intervention, I just felt that was the time to establish a short yen position. Thirdly, there was a double bottom formation forming on the 4-hour chart, and I felt that price was already breaking through the falling neck line. I entered on a pull back to the 117.20 level, which was a previous high level. I put my stop at 140 pips, and was setting a modest target at around 119.00. I felt with the combination of yen weakness and improved sentiment towards the euro, we would see this pair rise. The trade was looking alright yesterday… that is, before risk aversion took over the market and gave my trade a beating as bad as Barcelona’s whooping of Manchester United in the UEFA Final. Bad data from the U.S. caused traders to unwind their positions in higher-yielding currencies, which helped the yen rally. And as fate would have it, I got stopped out. Two things to take from this week. First, this just goes to show that anything can happen in the markets. You might be looking at a decent trade setup but completely slapped in the face by how the markets react to some economic data. Second, while it’s tough to see my account in the red now, I understand that ALL traders get into a slump. I just need to take a step back, evaluate what I’m doing wrong and make some changes. I’m confident that I can bounce back and put my account back into the black! Hope y’all had a better week than I did and if you plan on trading on NFP Friday, good luck!